On the morning of 19 February, the Chinese New Year's day, London Chinatown was immersed in a joyous festive atmosphere. Over 200 representatives from all circles in the UK and the Chinese communities gathered here, ready for an important event and two special guests. In a fanfare of gongs and drums, golden lions began dancing. 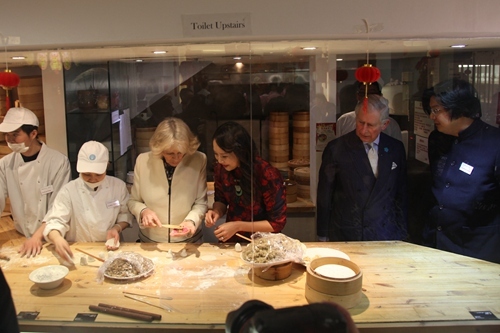 HRH The Prince of Wales and The Duchess of Cornwall arrived at Chinatown. The royal couple was greeted by H.E. 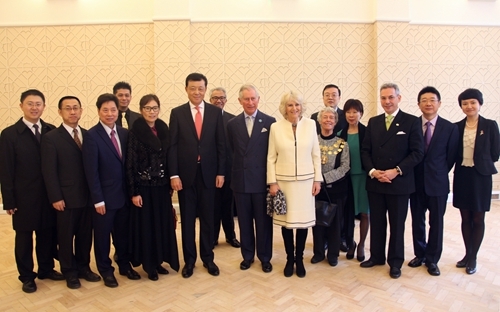 Ambassador Liu Xiaoming and his wife Madame Hu Pinghua, Councillor Audrey Lewis Lord Mayor of Westminster, Chinese British entrepreneur Sir David Tang and Chairman of London Chinatown Chinese Association Chu Ting Tang. More than 20 Chinese children in festival costumes were also there to welcome the couple. Accompanied by H.E. Ambassador Liu Xiaoming and Madame Hu Pinghua, the royal couple exchanged words of Chinese New Year greetings with members of the Chinese community who were present as they made their way to the Chinese restaurant "Dumplings Legend". They watched with great interest as chefs of the restaurant were making steamed buns, a classical Chinese dim sum. The Duchess of Cornwall tried making one herself. 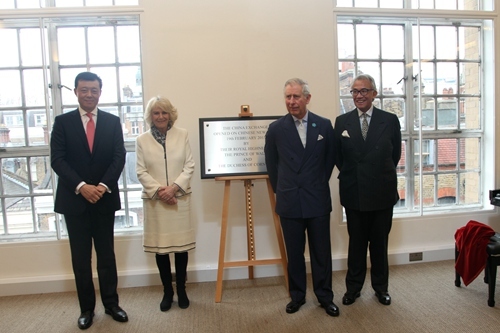 Afterwards, the royal couple and their company proceeded to open "China Exchange", a China-UK cultural exchange center funded by The Prince's Charities Foundation. At the "China Exchange", an exhibition of the Foundation's demonstration projects in China caught the attention of the couple. One of the projects, Beijing "Shijia Hutong Museum", is a reproduction of a classic residential courtyard using traditional crafts and green technologies. Another project, "Jinze Art Center", is dedicated to imparting traditional Chinese handicrafts and protecting intangible cultural heritages. The Duchess of Cornwall watched a Chinese calligraphy demonstration and gave the writing brush a try. Her creation of a Chinese character "天 (heaven)" was so impressively graceful it won her warm applauses. At about 11 am, the opening ceremony of "China Exchange" began. Ambassador Liu and The Prince of Wales each gave a speech. 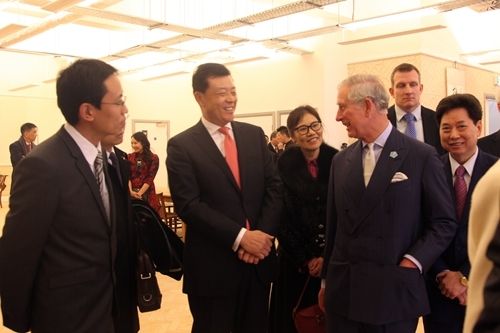 The Ambassador spoke highly of The Prince of Wales' continuous support for China-UK cultural and educational exchanges and made positive comments on the contribution of Prince's Charities Foundation to the protection of Chinese Hutong, traditional architectures and cultures. He hoped that "China Exchange" could play an important role in promoting two-way cultural exchanges. 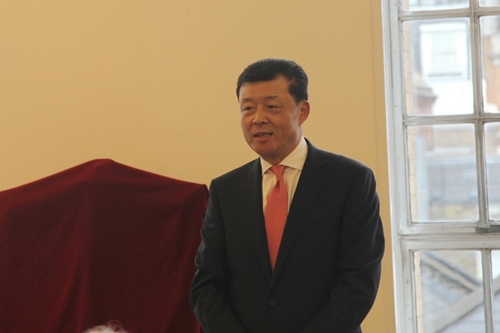 The Ambassador Liu borrowed the good meanings of the sheep in the Chinese culture to wish China-UK strategic partnership greater progress, to wish China-UK cooperation fruitful achievements, and to wish everyone present health and happiness in the Chinese Year of the Sheep. 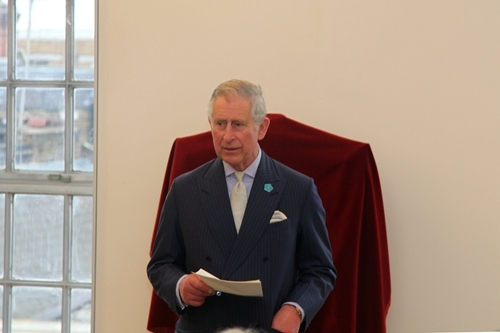 The Prince of Wales began his speech with a "Happy New Year" in Chinese. He said that he was very happy to celebrate the Year of the Sheep on the Chinese New Year's day with the Chinese community and see the fruitful achievements of Prince's Charities Foundation in China. He wanted to set up a Chinese cultural center eight years ago when visiting London Chinatown, and that dream finally came true. He hoped "China Exchange" could host rich and colorful cultural and artistic activities and serve as a vital platform to promote the East-West exchange of ideas and the development of the Chinese community in the UK. At noon, crowds began to gather at the "China Exchange", heightening the festive joy. Local British citizens were drawn here to share the happiness of Chinese New Year and enjoy the charms of Chinese culture. The Spring Festival celebrations in London and the opening ceremony of "China Exchange" unveiled the China-UK Year of Cultural Exchange. Exciting programmes of exchange between the two countries are to take place.